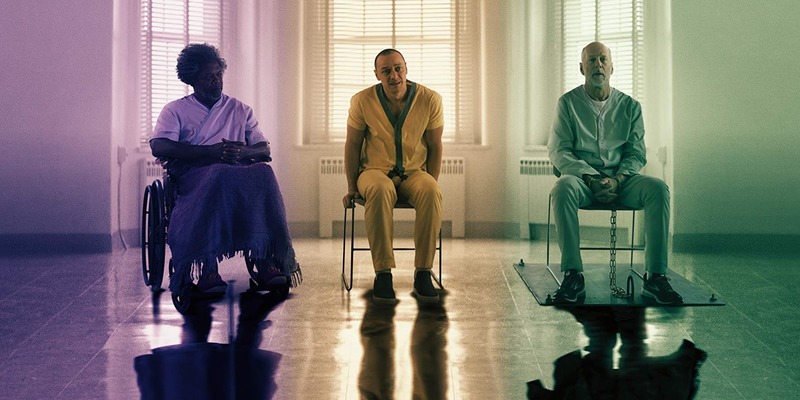 'Glass' review: Comic book tropes for better or worse – AiPT! Exceptionally entertaining if you love comic books. Nearly 19 years ago Unbreakable, M. Night Shyamalan’s second film after The Sixth Sense was released and my 15-year-old self couldn’t contain himself. Good superhero movies were rare, but to approach a superhero narrative in a realistic way? Sign me up. It was a film that rocked the senses with a pace that bordered on sexual tension, a score that raised the hair on your neck, and an approach that was deft. It was a movie I desperately hoped got a sequel for years, but that didn’t happen until 2016 when Split arrived. It’s no spoiler at this point that Split ended with Bruce Willis’ hero character David Dunn appearing, completely blowing away fans of the incredible Unbreakable. That got the ball moving on this third film, appropriately titled Glass because why the hell shouldn’t Sam Jackson get his own superhero movie? It’s hard to believe Unbreakable is nearly 20 years old. The answer to that question for many will be: God, I wish he didn’t. I can understand the negative reviews and sour faces that leave the cinema and it’s partly not this film’s fault. Marvel Comics has put out such great superhero movies the expectations are impossible. This is a different kind of superhero movie, with very little special effects and a much more hyper-focused look at a character. You can see it in the many super close up shots and the almost 50 minutes it takes to give Sam Jackson any lines at all. This is a movie similar to Unbreakable due to its pace and slow resolve with sparks of Split thanks to some horrific and scary moments. If that sounds appealing to you I recommend this film. Unfortunately for most, there are going to be two types who see this film. For those who don’t know, Glass is all about Dunn being an unbreakable man, James McAvoy playing a man with multiple personality disorder with one person being able to manifest into a raging beast, and Mr. Glass being super smart but super easy to hurt physically. They are all brought together by Sara Paulson’s psychiatrist character so that she may prove they are not super by any means. What follows is a story about identity, self-doubt, and a deeper story about rising up to be the best you. It’s like Oprah for superheroes. Sarah Paulson’s psychiatrist character drives much of the plot for better or worse. The second type will roll their eyes at the presumption that heroes, or at least the ones here, are worth a damn. The first third of this film follows the vigilante storyline to a T coming off as almost boring if you’re not fully invested in the love letter that is this film. There are also glaringly odd plot holes that can pull you out of the film. Characters should not act and say the things they do in the real world. It’s a lot to bare and more than once even I twitched at an awkward moment before easing myself into enjoying it for what it is trying to be. Keyword “trying”. The three main characters matter more than you think. Much of this film is artifice that can be punched through like wet paper. The guards are so lax it’s a joke, characters say things without explanation simply to move the plot along, and there are forced turns in the story to keep characters moving ahead. I will admit there are a few twists that help keep this wet paper together, but it still feels like the film could have used a rewrite or two to avoid plot holes and groan-worthy dialogue. Take for instance an early scene where Anya Taylor-Joy’s character is told the Beast is alive. The authority figure at her school talks to her as if she needs to fill us in, not like she would to a girl probably still reeling from Stockholm syndrome. It’s clunky and unnecessary. There’s also a scene with M. Night Shyamalan reprising a minor role he played in Unbreakable. It serves little purpose than to insert the director into yet another movie and could have been excised easily. Finally, I won’t beat actor Spencer Treat Clark up for reprising his role as David’s son, but his acting is subpar at times pulling you out of the film. There is one thing I think everyone can agree upon and that is how good James McAvoy is in this film. There are long stretches where you’ll be entertained by his acting alone. He’s funny, weird, scary, and captivating at different moments as he plays his 23 split personalities. Entire scenes are saved simply because they cut to him doing his weird thing be it dancing, acting odd, or just changing on command. He’s excellent in this and practically Oscar worthy if the Academy gave a damn about genre films. Sam Jackson and Bruce Willis are good where they need to be. Jackson gets some of the meatier dialogue scenes and nails them as we’ve come to expect. Willis gets much less to do, but when he does speak you never lose sight of his superheroism underneath. All of these characters are dealing with a crisis of faith in themselves at certain points and they do well to capture that dilemma. I wanted Glass to be so much more than it is, but now that it has come and gone I’m at peace with it. The music is excellent, the cinematography creative and clever, and it contains a story that certainly isn’t boring. The problem is if you’re not fully invested in superheroes and this world Shyamalan is holding up it all falls apart. It’s easy to poke holes in it. It’s good but falls short due to plot holes and sometimes cringy dialogue. It’s well made and never boring, but it falls way short for you if comic books aren’t life. Great fun if you love comic books, but if you're a casual fan temper your expectations, this is a bumpy ride.